Meadowview in Swoope, Virginia is in the headwaters of the Shenandoah River. These perennial grass pastures help produce clean water. We live on a farm in the headwaters of the Shenandoah River – a tributary of the Chesapeake Bay. How cool is that? 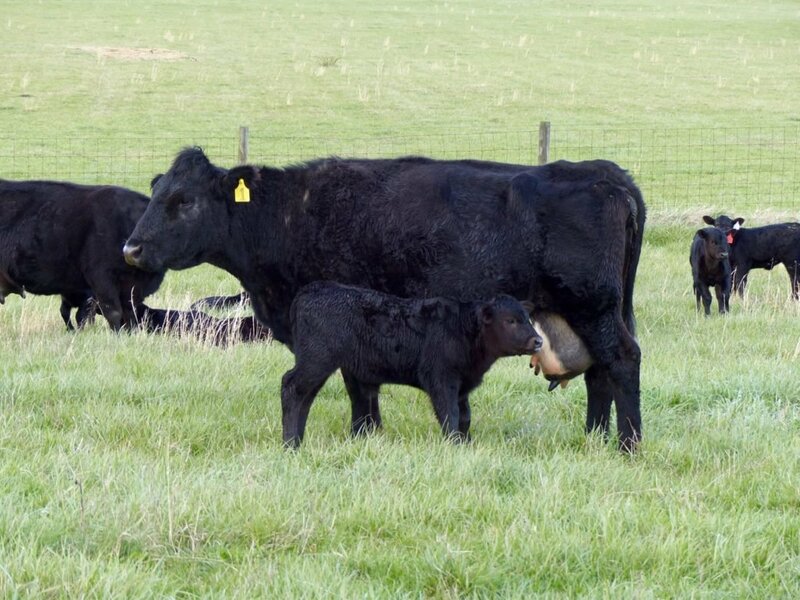 We started this year’s calving season on March 1st with 122 pregnant beef cows. All of them have calved except nine. Cow #65 and #X6 had twins. What an udder! One of our best cows with her baby. 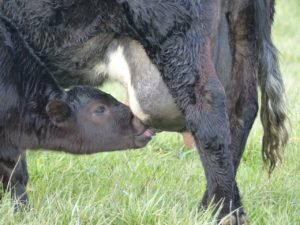 Her calves usually gain at least three pounds a day; all on just grass and milk. I write this on Earth Day and the rising temperatures of April accelerate the surge of spring. Living and working on a farm gives me many opportunities to experience special moments, those moments when you are still and quiet and can breathe in the surge of spring. Our calves are grown on milk and grass. There’s a Red Fox (Vulpes vulpes) den in one of the pastures. Each day I check on the cows I can see a couple of kits playing near their holes in the land. I call it a fox “hotel” because of all the holes. A parent fox always watches me from a distance. The kits peek out of their holes as I watch. There are five kits this year. One time I saw all five playing, like a bunch of kittens rolling around on each other. 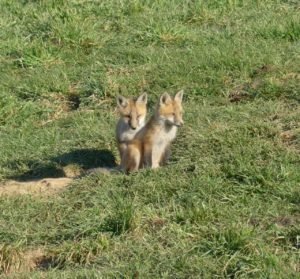 Eastern Red Fox kits in the pastures of Swoope. In the early evenings when the farm chores are completed I usually sit on the patio under the towering branches of the Silver Maple and Southern Pecan trees and wait for one of those special moments. 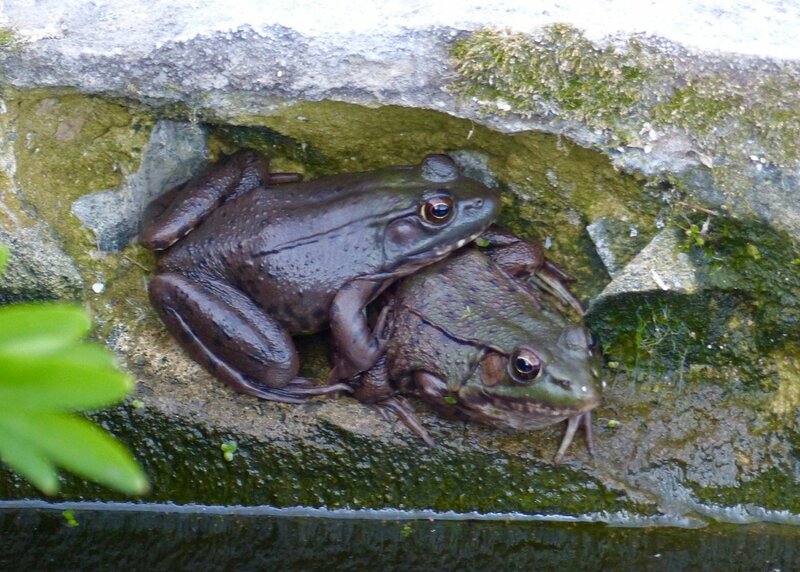 Today I see two Green Frogs (Lithobates clamitans) staring at me from the small concrete pond we have near the patio. They don’t move. They are the ones that sound like a banjo string being plucked. This time of year is my favorite because of the avian migration. Every couple of days a new migrant passes through or arrives. It starts with the Red-wing Black Birds in February, then Chipping Sparrows, then Tree Swallows. Now it’s warblers, those tiny gems of the tree tops and today, Earth Day 2016, I witnessed the first warbler “fallout” at Meadowview. The moment I was waiting for arrived. I couldn’t see them at first but I heard them; that cascading melodious song. Warbler songs used to drive me crazy when I did not know what they were. But now, after much study, I can bird by ear. It must be the Yellow-rumped Warbler, I thought. Way up in the top of the towering tree branches I see tiny birds flitting around. Binos in hand, I wait for one of the specks to land. They will only be still for a split second. There it is. Yes, Yellow-rump Warbler (Setophaga coronata) A whole bunch of them. Birders call it a warbler “fallout”. 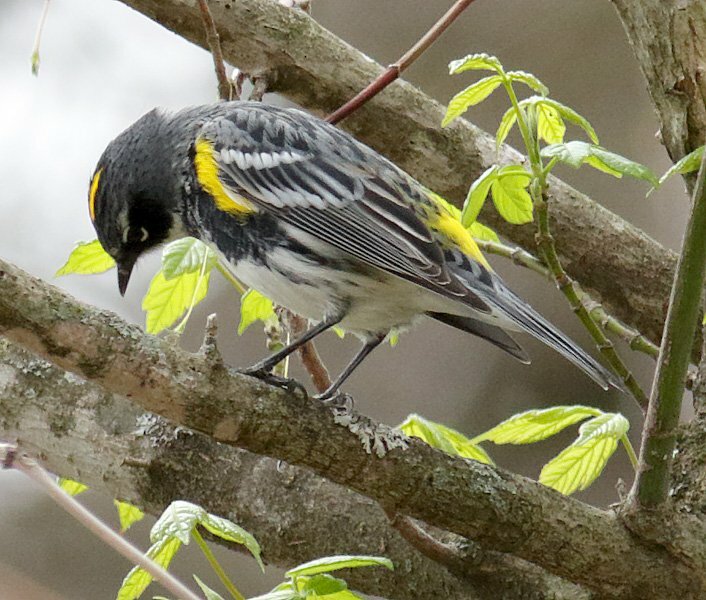 The Yellow-rumped Warbler is a 5 1/2 inch bird of the treetops. They are passing through Swoope on their way to Canada to breed for the summer. It is indeed a special moment to have them visit here in Swoope. Earth Day needs more attention and promotion Bobby. My daughter came home from school the other day to tell me there were no school events this year nor did most of the kids think it was important anymore. “Kids don’t get presents” she said so it doesn’t rank very high on kid’s priority lists. There is still much the local Soil and Water Conservation Districts and USDA could do to increase education. Anita, thanks for your comment. Yes, we can grow Pecans. We cannot beat the squirrels to them. We have fox kits I our field too…4 of them in a former ground hog den. I don’t think Obama said anything about, and McAuliffe was silent too. Hi Bobby – Thank you for capturing a perfect spring day on your farm in Swoope. Thanks Kayla, for your kind words. Good to hear from you. Hope all is well on the Mountain. Bobby, I received this beautiful Earth Day essay from my brother Walter Eyles. Your lovely descriptions of all the spring time activities on your farm are beautifully written and express your love life and the deep joy of spring. Everything is renewed, even though it is a repeat of the spring before, it’s different and more beautiful with people like you in it. Thank you for this essay it brought me joy today in upstate New York where spring is just beginning. Nancy, thanks so much for your kind words. Enjoy the Spring! As always, a joy and pleasure to read your observations. Thanks for your kind words Charlotte and thanks for stopping in on the website. Always a treat to read. I’ve had blue bird boxes for years. I have not seen a blue bird yet this year and neither has my neighbor. Don’t know what it means. Enjoy your time in Swoope. Tell Jeanne hello. Thanks for stopping by Roger. Your Bluebirds should be nesting by now. We have a few boxes with eggs in them. Great description of Spring. We do need to find a better way to share your and my connection with nature with the kids and their parents. They have no idea of what they are missing. I spent sometime yesterday at our place in West Virginia. It only gets better with each visit. Love this blog. You live a euphoric life in paradise, that is for sure. Your being skilled at noticing and reporting to the rest of us all about what you see makes our world so much bigger just for reading. Thank you for sharing your adventures in life. Laurie, thanks so much for your very kind words. I so respect what you are doing on the Mountain and in Staunton. Thanks so much for your blog! It is truly inspirational. We have Blue Birds nesting in our yard just outside of Waynesboro, and presently are enjoying watching what we are pretty sure of is a pair of Rufous-sided Towhees. Yesterday, we had 8 Blue Jays eating from our pan of sunflower seeds! Mary, thank you so much for stopping in. Glad you have Bluebirds. Warbling Vireos and Orchard Orioles showed up yesterday. Earth day was always taken seriously in schools when I was younger. We did poster projects and promoted recycling and how important our natural resources are. I was lucky enough to go to a high school where they had a Science Academy I was accepted into. One of our yearly goals was earth day promotion. I believe those events and awareness and even just keeping our earth in conversation is what led me into being an ISAT major. I’d hate for any of these opportunities I was given to not be introduced to other young students. Appreciation for the earth we live on is so incredibly important. This all sounds like something out of a story book to be honest. Sometimes when the craziness and stress of the real world start to get to me, I like to go out into nature and experience things like these. In the hustle and bustle of the electronic world today, sometimes we get caught up in the superficial things. I believe that it is important to remember the little things like these, and to not lose sight of these things. There is something so majestic about witnessing events and animals like this in nature that I believe is a cure to any ailment. Every day should be Earth Day, not just one day out of the year. We live in such a magnificent place that we should cherish it every day and work to protect it every day. Nick, that was a very nice post; thank you. These are wonderful observations of the nature that surrounds you. The pictures help illustrate your descriptions. Sitting, observing, and documenting nature is one of the best ways I’ve found to feel peace and appreciate the wonderful world we live in. Whenever I see pictures of nature I am amazed at what I see and appreciate what I don’t see. Behind a photo is the time you spent getting the right composition, the time you spent searching for your subject, and gaining its trust. Thanks for sharing! Sarah, thank you so much for your kind words. This post really illustrates the beauty of nature, specifically on a farm. I would love to live somewhere like this when I am older, the scenery is beautiful. It also sounds so rewarding caring for your own livestock year after year, looking at the progress made every year. All of the various wildlife surrounding and passing through the land amazes me. I love the outdoors, and this sounds like pure bliss. The descriptive language and intriguing pictures really makes me wish I was out in the wilderness rather than sitting in a classroom. Spot on Madelynn. Thank you. Its amazing that a farm can support such diverse and native wildlife while still be used to produce goods for human needs. My home in Maryland is on the border of a protected Forrest so we make sure to give all the animals we see extra space to not disturb them. I think its great that you can interact with all these animals in such a simple way. I chose to read this post because I saw “Fox Kits” in the title. I personally love foxes and have had the pleasure of occasionally seeing some in the wooded neighborhood I grew up in (one even in the backyard). I greatly enjoyed reading this post because I could imagine seeing all of this going on right before my eyes. Your descriptions of the activities going on on the farm are wonderful and it inspires me to remember to set some time aside and enjoy the beautiful things that are going on around us all the time. Mikayla, you are so sweet. Thank you for your kink words. And yes, you should set aside time to enjoy the beauty around us. Very beautiful pictures, professor Whitescarver. Your compelling descriptions of the wildlife on your farm remind me of the language Leopold uses to characterize the beauty and wildness of the land in Madison, Wisconsin. Thomas, thanks for your very kind words. I must admit, when Earth Day would roll around every year prior to college, I never truly paid any mind to it. I would be reminded of the day through social media or get a reminder on my phone and then would simply look outside, take in the view, and carry on with my day. When I started college and began my career as an ISAT student however, I started to develop more of an appreciation for the day. I would make it a point to remind my peers on social media of the importance day (very brief) as well do something outside for at least 20 minutes. But I must say, after reading this article, and seeing how one really soaks in all that nature has to offer, I feel as though I could really do more to be involved in Earth Day. 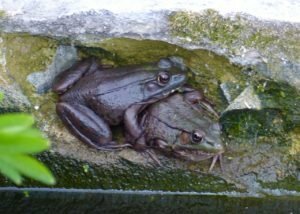 Reading all of your descriptions from observing the kits, frogs, and warblers and the imagery you use exemplifies how you appreciate the natural world and all of the animals/processes involved. That is what I aspire to be like every time day comes around. Instead of just reminding everyone of the day and being outside for just a short amount of time, I want to use the day as an opportunity to separate myself from all technology and anything that might put me under stress. I want to make an effort to use the day for some one-on-one time with me and mother nature. Seeing as how sensitive the environment is to human activities and observing the consequences from decades of neglect, I will make it a point to not only remind my peers of the day, but also to educate them on the importance of caring for our natural world and telling them what they can do to preserve its beauty in anyway that they can. Daniel, I am very proud of you. Let’s get outdoors! It’s pretty refreshing to see wildlife thriving outside of populated cities, especially considering that in these more populated areas; animals are not so abundant and are rarely seen. This really just gets you thinking about how beautiful nature is and how people take it for granted. With that being said, Earth Day is definitely an underappreciated holiday especially since a majority of the human population lives within urban areas and do not really think about the beauty that lies outside of these areas.